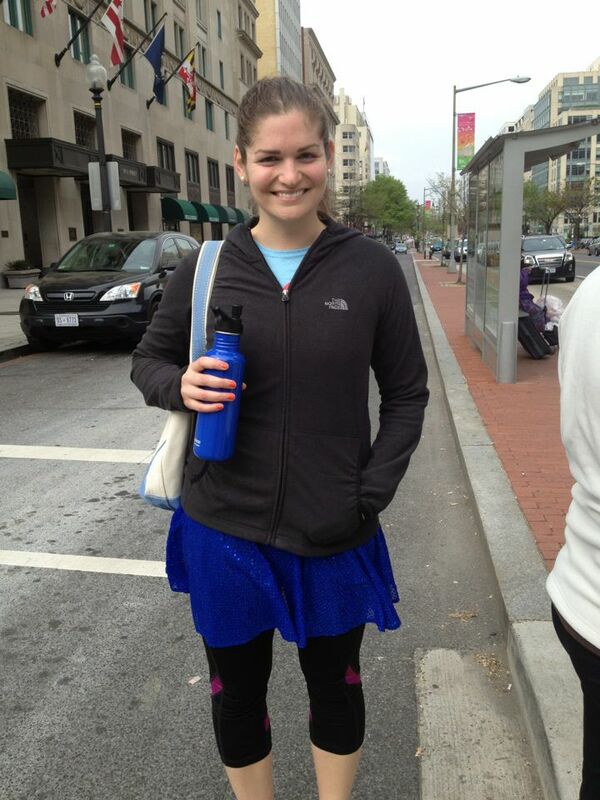 On Sunday I ran the Cherry Blossom 10 Miler for the first time and let me just say, I loved this race! Before I say anything else let me start by saying that the race organizers and volunteers did a fantastic job from the expo to the actual race. I love a well-organized race and I really feel like it makes all the difference. I’m glad it wasn’t another Hot Chocolate debacle. I can only hope that the triathlon in August is this well-organized. My mom and sister were in town this weekend which was an extra special bonus. They arrived on Saturday and we immediately walked up the street to Taylor Gourmet and had a delicious lunch. My sister raved about her sandwich and my mom had a really good salad. We then worked our way over to Georgetown for some serious walking and shopping. We always like to cram ourselves into changing rooms together and it’s just always a hilarious scene. If anyone is going to be honest about how an outfit looks, it’s definitely my mom and sister! We ended Saturday with dinner at District Commons. It was a winner! I had been there once before and was hoping my mom would really enjoy it and luckily she did. Does anyone else get nervous when they have guests in town and have to pick out restaurants? I always have a twinge of nervousness when everyone sits down to look at the menu for the first time. I had shrimp and grits and shared the lemon pie with my mom. Delicious! Sunday morning we were up bright and early. I woke up before my alarm and made some coffee and an english muffin with some White Chocolate Wonderful and banana. It was the perfect pre-race breakfast for me. 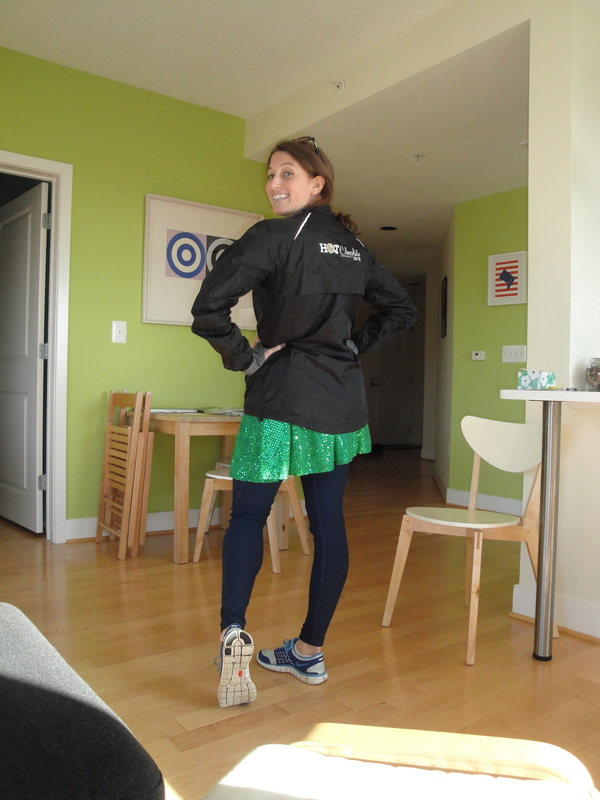 I ended up in capri pants, my sparkle skirt, my I Love Sweat shirt and my Sweaty Band pink headband. My mom, sister and I started our walk down to the race and immediately were joined by others heading down there as well. I didn’t get to meet up with my friend but did run into some co-workers and ended up lining up in a corral with one of them. We could hear all the other waves of runners starting in front of us and suddenly it was our turn and we were off. I still had Addy’s Garmin and in my head I was determined to keep around a 10-minute mile average and to finish the race in under 1:45:00. The first mile was slow as all the runner’s tried to find their footing and when the Garmin beeped I saw that we were at a 10:26 pace. So then I took off. The second mile was 9:36 and then I realized I should probably slow down…but I didn’t. The next 4 miles were run around the same pace (some even faster!! I did a 9:10 mile at one point!) 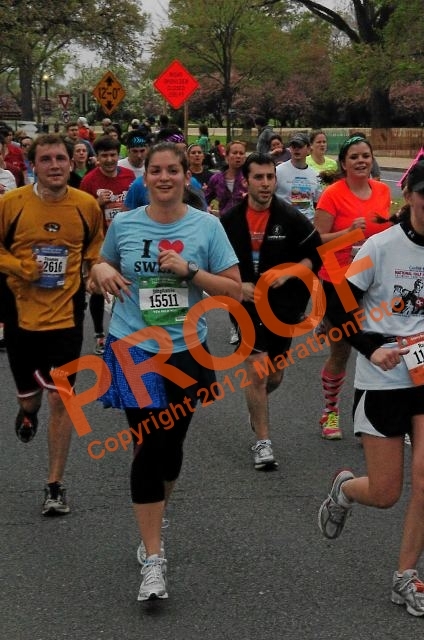 and suddenly it was mile 6 (the race went by SO quickly). 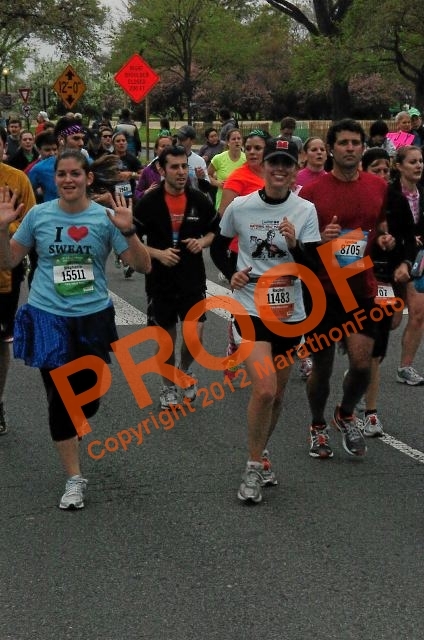 But wait, let’s back it up, I knew that Addy was going to be at mile 5 so I was on the look out for her. To my surprise I first saw my mom and sister who were jumping up and down like mad women cheering for me. It was such a great boost of energy! A few paces down the road I saw Addy who was flying in the air with excitement. I’m pretty sure I told her I was running too fast when she asked how I felt. Nice, Stephanie. She ran a bit with me and really pumped me up for the second half of the race. I ran away smiling and feeling good. And then I had a sudden wave of nausea and was super paranoid I was going to be sick and then suddenly it was gone. It was really weird but I’m so glad it went away. Aren’t you glad I shared that? Miles 6-9 are basically around Haines Point which was just a lot of solid running without a lot of spectators. At mile 7, I hit my wall. We passed the mile marker and a runner shouted, “less than a 5k left!” which was greeted with a ton of cheers from surrounding runners. I felt people pick up their speed all around me but I felt the complete opposite and I regretted running those earlier miles so fast. I reached for my Honey Stingers and only managed to chew down 1. At mile 8 I said, only two more miles, out loud to myself. And then I looked up saw my friend Ryan on the side of the road. I didn’t know if he had run the race or what (and still don’t know – aren’t I a good friend?) but he came into the road and race with me a few paces and reminded me that I was almost done. I told him I was dying…could I be more dramatic? When I passed the 9 mile marker, I again told myself out loud, only one more mile. People all around me were really speeding up now to power through the finish but I reminded myself that this race was all about me and that it was OK to stay at my current speed and to do whatever it was I needed to do to keep going to finish this race. My last 3 miles were all in the 10:00 minute mile range with the slowest being 10:14. My friend Katie ran past me with 500 yards to go and while I couldn’t speed up to stay with her to finish it was helpful to “follow” her to the finish. The last half mile is uphill (I know, right) but it was lined with people and I kept breathing, took my time and made it. Right before I crossed the finish line I heard more screaming and turned to see my mom and sister, yet again, going wild on the sidelines. I felt really good post-race and my average pace was 9:55!!! I beat my goal of keeping a 10-mintue mile pace!! I finished the race with a time of 1:39:11 and I am very happy with it. I definitely feel like the Garmin helped push me through my goal. Knowing my pace was so helpful. I recycled my timing chip in hopes of getting into the race again next year so I can get a new PR. Yup, I am already thinking about this race for next year. Woo! This is me trying to look positive and happy around the camera. I like how the other people around me are smiling too. Apparently we all love paying to be told where to run in a mass of people. The rest of the weekend consisted of brunch at Agora, a glorious pedicure, a wonderful nap, dinner at The Hamilton and breakfast at the The Tabard Inn. Could a girl be any luckier? I am feeling good today but need to work out some knots and tightness on my right leg. Today is my day of rest and then I start on my April fitness goals. Post-race getting my Nuun on and feeling good. Even though it’s the second week in December, I wanted to put together some December fitness goals. I always find that after I do a race, I completely fall off the work out bandwagon. I don’t know if it’s because I was so focused on a training program or because I mentally think that I’ve done A LOT but I need to not make it a habit. Also, with holiday parties right and left, this is NOT the time to be slacking on working out. I should be ramping up my workouts so I can enjoy more goodies during the holiday season. Get back on the wagon with running right away with Fitness Magazine’s “Running for Weight Loss” training plan. I love this training plan. It’s treadmill friendly, which is perfect for a cold month like December, and a nice way for me to start getting good use out of my pricey gym again. It’s fun training for a race but I did a lot of running outdoors and felt guilty paying my gym fees when I was barely there. Get back to the gym classes I love – Zumba, Body Pump, Step, etc. One of the reasons I really love my gym, besides the fact that it is literally less than a block away from my apartment, is the variety of classes it offers. They have a ton of great morning classes and even classes as late as 8pm on weeknights and they really all work with my schedule. They also offer a ton of great weekend classes, including yoga as late at 6:00pm on Sunday. So, I really need to start taking advantage of these classes again because they are also a great way to get in a workout on days when I really just feel like sitting on my couch. Participate in the 100 pushups challenge. This has been all over the blogosphere and I’m ready to get on board. I can also only do 10 push-ups on my knees…barely. Wish me luck on this one. Looking forward to 2012, my co-worker and I are taking the plunge into the Barre Method and are devoting the month of January to the practice. I put a freeze on my gym account and will be doing only Barre Method 3-5 times a week for the month of January. I hope to increase my flexibility dramatically and gain some great core strength before I plunge back into training for running races and triathlons. I don’t make New Year’s resolutions. I make birthday year resolutions. Considering my birthday is in March, I still have a few months to figure out what I want to accomplish to make my 29th year my best. I’m excited just thinking about it! My first official race recap! Too bad it’s going to be a very, very grumpy one due to the extreme lack of organization by RAM Racing. I drove with two co-workers on Friday to pick up all of our race packets. It was nice to get a dry run in before Saturday because I was worried about the logistics for this race. The expo was pretty bare bones and there were some issues with the sizing in the windbreakers that came in the race packets, but it was easy in-and-out for the packet pick up. After a unnecessarily carb-heavy day on Friday, I packed my bag, laid out my outfit and went to bed excited and ready to run. On Saturday, I woke up at 5:15am, made some coffee, drank some water and toasted my bagel thin (only to discover that I didn’t have any butter, cream cheese or peanut butter – go me). I was in my car by 6:00am off to pick up my first co-worker. By 6:20am we had our second co-worker, her husband and her friend and were en route to the race. We were flying down the highway and then hit a wall of traffic on the exit ramp to the race. As the traffic inched forward we started to have a little bit of panic about actually making it in time. We ended up parking by 7:10am, and my co-worker and her friend who were running the 5k, sprinted away in order to be at the start line by 7:30am. Little did we know they had all the time in the world. The start line was a good 20 minute walk from where we were directed to park. I found my co-worker I had trained with and we made our way toward the start line at around 7:30am (our race was scheduled to start at 8:00am, with the 5k starting at 7:30am). 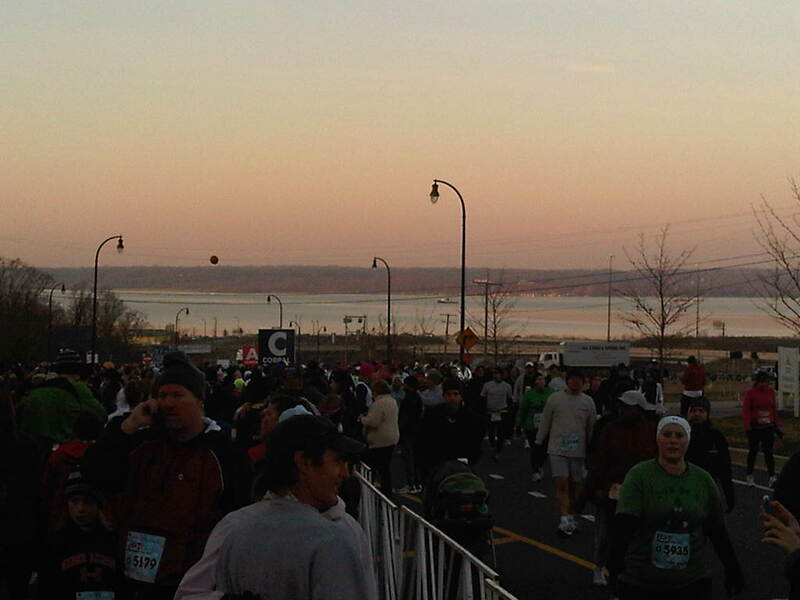 As we approached the start line we couldn’t believe how many people were lined up in the corrals already. I knew 20,000 people had signed up for the race but this looked just insane. As we continued up the hill to the start we realized that the people in line were for the 5k, which was now almost 30 minutes late. Luckily, I did get to see Addy before she ran which was a nice surprise. Our sparkle skirt were able to re-unite and have a photo together 🙂 Needless to say, she wasn’t too happy with how the morning was unfolding. The announcer said that the 5k was going to start shortly, so we wished her good luck and went on our way. We managed to find our other co-worker who had trained with us and proceeded to spend the next hour and a half huddled together in the cold bitching. I had to use the restroom and people were venturing up into the woods and then stumbling down the hill back to the corrals. That looked unappealing to me and I ended up popping a squat in the parking lot while one co-worker blocked me. It was like we were at tailgate except that I was freezing, not drunk and wearing running clothes. Naturally, there was a huge line of porta-potties but they were in a fenced in area that we couldn’t access. The sun was rising but didn’t warm us up until we started running. I’m glad I invested in some running tights and wore a throw-away long sleeve shirt but all my stretching was out the window and I was tight and shivering. We stood in the cold for almost TWO HOURS listening to this annoying announcer give us fun facts about chocolate. I’ve never disliked someone I had never met so much in my life. (Later when we ran past the announcer I pointed him out to my co-worker and we both gave him a nasty look.) Finally, at 9:00am the race began (that’s an hour late) and with so many people I did not cross the start line until 9:25am. We were FINALLY running. Except that we were barely moving due to the sheer number of people, the fact that no one had lined up in the correct corral and the extremely narrow course. The first five miles was an out and back loop on a highway that was not completely blocked off. It isn’t a good feeling to be running next to huge trucks. My co-worker and I were dodging people right and left. People who were WALKING in the first mile of the race. I burned so much energy those first 4 miles that it totally screwed up my pace. Before we approached mile 5, I turned to my co-worker and said, “I’m completely exhausted.” She felt the same way and we spent the next 4.3 miles pushing each other up hills, sharing words of encouragement and getting through that race. I could not have done it without her. The course was completely packed the entire race. I never had a chance to get into a good groove and there were 4 hills that were pretty brutal. To add insult to injury, the water stations were a complete mess and runners were pouring water themselves because there were not enough volunteers to accommodate the number of runners coming through. The last leg of the race was a steep hill and if it had not been lined with spectators and other racers cheering me on, I would not have made it. I was hunched over, crawling my way up the hill and some random man yelled right at me, “YOU CAN DO IT!! !” and he gave me the extra energy boost I needed to get up there and finish. That’s one thing I really love about races, everyone is out there for the same reason and to support each other. It’s a great community. Once the race ended we had to walk up a huge hill to get the hot chocolate/fondue tent. I was so unhappy with the whole event and the smell of chocolate was not comforting to my stomach at all so my carload of people and I started the hike back to the car and got the heck out of there. I had paid extra to be in the prime parking lot which we later found out was NOT the parking lot we had parked in. Not surprising at all. After making our escape we headed to the new bagel place in our ‘hood – Bethesda Bagel. As a former resident of Bethesda, I knew what I was in store for and the new location did not disappoint. I ate a turkey club on an everything bagel that was the size of my face and it was so delicious and exactly what I needed. Take that, fondue! I proceeded to come home and take a three hour nap. It’s amazing how running and large bagel sandwich can knock me right out. I need to bottle that up for a new sleeping pill! I will never do another race organized by RAM Racing again. The owner of RAM Racing sent out an apology email that was full of excuses and he/she didn’t even sign their name at the end of it. Talk about cowardly. For the expense I spent on this race, it was not worth it. The only silver lining is that I ran the 15k in 1:33:29 which was a 10:33 minute mile pace and I’m pretty darn happy with that. Seeing as how I’ve never run this distance before it’s a PR for me. Woo! I do think we could have kept to under a 10 minute mile pace had we had the room to run and get into a groove. I’m now working on my fitness plan for December and January and looking forward to next year and other races I want to add to my calendar. It’s true, you run a few races and you do get addicted. At least it’s a good habit to have! This weekend was extremely productive. 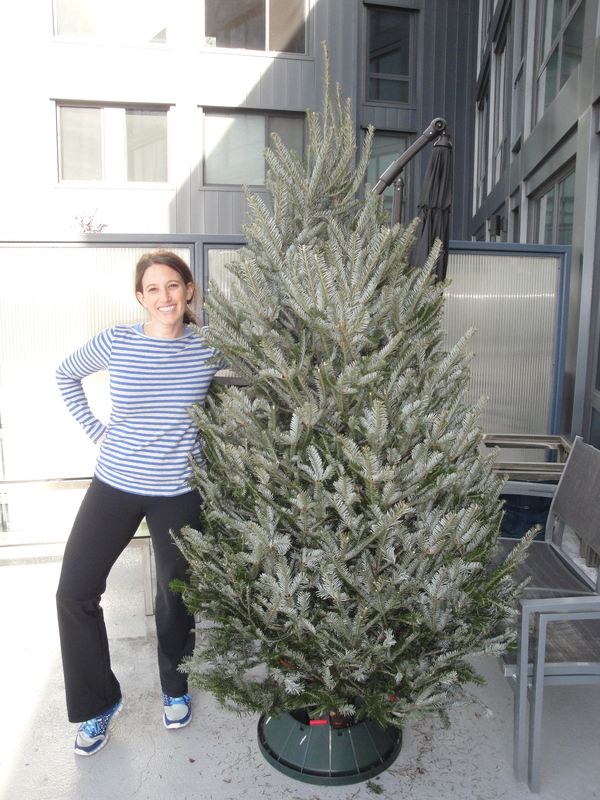 I hosted a baby shower at my home (more on that in a later post), ran a not so well organized 5k and got a Christmas tree, like our first real Christmas tree. First thing Saturday morning I woke up to drive out to the National Harbor for the Hot Chocolate 5k/15k. My husband was supposed to run the 15k, but decided he didn’t really want to wake up at the crack of dawn to run 9 miles. Turns out, he totally had the right idea all along. I picked up a co-worker on the way and think we were one of the lucky ones because it only took us 30 minutes to park. The traffic was lined up for from all directions for miles. Once we parked, we walked almost 20 minutes to the start line. On the way, we heard the 5k was likely starting 15 minutes late, fine I thought, I can handle 15 minutes. Turns out, it was actually delayed 45 minutes. The race organizers completely underestimated the massive amount of people coming in for this race! You can see the anxiety/annoyance in everybody! 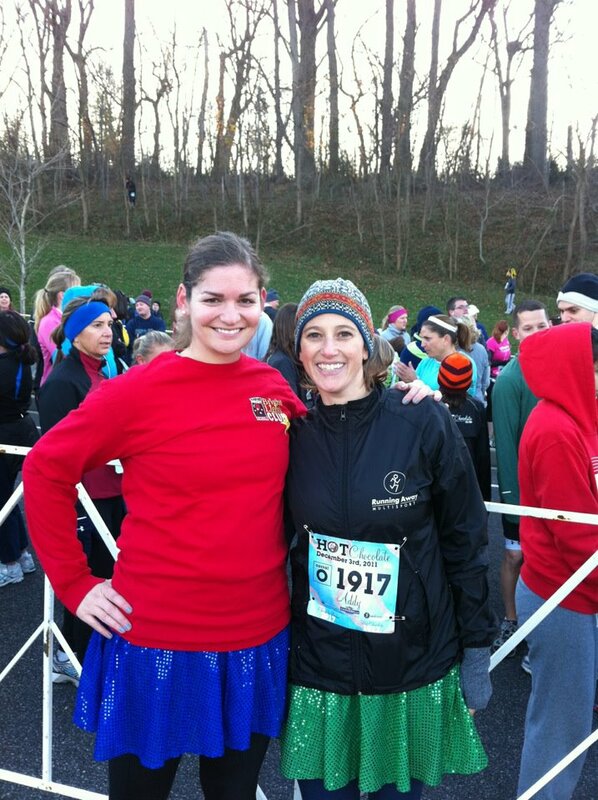 Lucky for me, while I was waiting in the corral to start the race, I spotted from afar my fellow sparkle skirt, district delights co-hort, Stephanie. 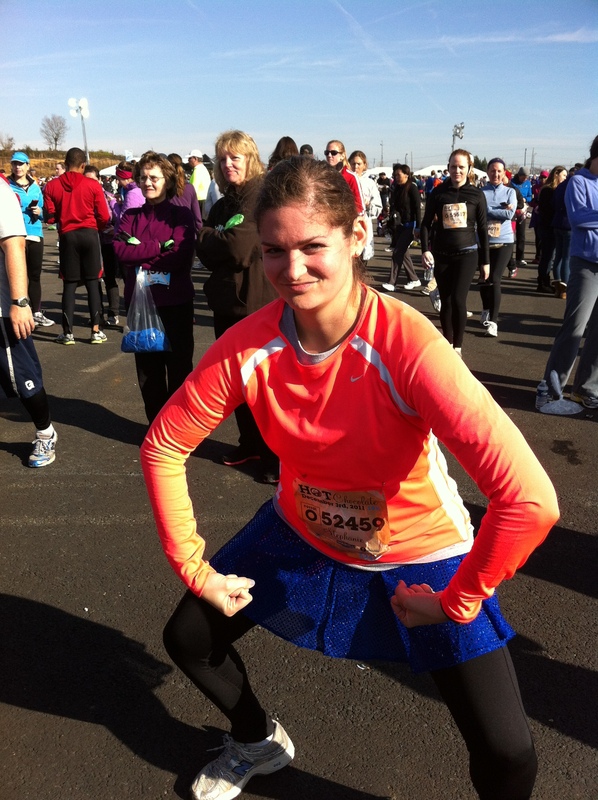 She ran the 15k and totally owned it!!! But I will let her tell you how awesome she is in her own words! Once the race started for me, my feet were numb from standing around, but I tried to dart around everyone to finally get warm. Unfortunately, we started running down a very small walking path, so it was hard to manauever around everybody, but finally the path widened a little and the crowd thinned out a bit and I was able to do my thing. I felt good through the whole race, struggled a bit the last 1/2 mile uphill, but achieved my goal of per mile pace and I finished in 28:20, a 5k PR for me! After the race, I peaced out of there so quickly, I had no interest in the hot chocolate or the chocolate fondue – after the delay of the start, I wanted to get out of there before I ran into another shitshow. I came home to get ready for the baby shower, which was a huge success, I must say. I didn’t take pictures at all, but one of the other hosts did – once she sends me some, I’ll do a proper post! 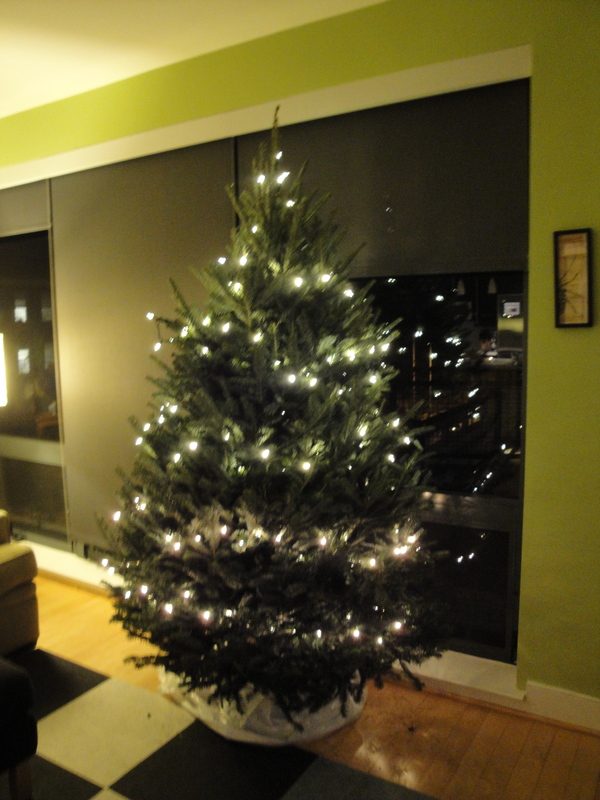 Today we got our very first *real* Christmas tree. I say real because the last two years we’ve gotten trees, but they’ve been miniature. This tree is 7 foot and a real beauty! We ended up buying it at our Whole Foods across the street. Justin carried that tree all the way home, and admitted it was quite a bicep workout! After we got the tree, I did a few errands and then met up with my nephew to take him to his swim lesson and grab some take out dinner at Comet Ping Pong! Once home for the evening, Justin and I got some lights on the tree and then discovered that we didn’t buy the hangers for the decorative balls we bought, I’ll have to hit up Ace Hardware again tomorrow. So here she is in all her light glory, more tree trimming photos to come!